It's GBBO tonight, and as usual I'm celebrating with another bake--this one a family favourite for breakfast or brunch. 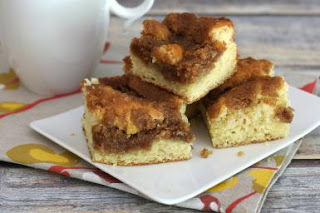 UK readers, coffee cake in the US is not cake with coffee as an ingredient, but rather a morning cake to serve with coffee-delicious! For topping, cut butter into flour, sugar and cinnamon until crumbly. For cake, mix flour and baking powder. Add sugar to butter and egg; add milk and vanilla the mix with flour. Spread batter in greased 8 or 9 in cake pan. Bake in a 160/325 oven for 30 minutes. Thanks to Southern Food for the recipe! Perfect treat to have with my coffee, it looks great. Thanks for the recipe!